A crossing guard stands near Gander Elementary school on June 26, 2018. ST. JOHN'S, N.L. 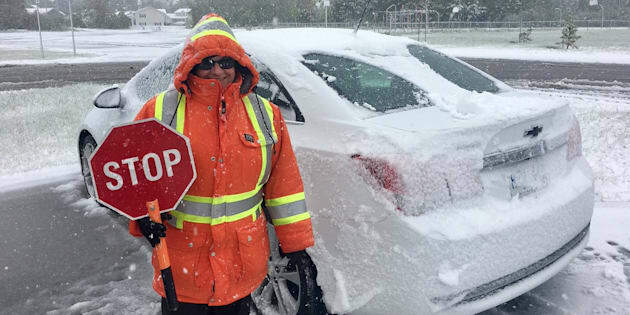 — It may be summer, but snow is falling in parts of Newfoundland today. The province's Transportation Department is warning residents to drive cautiously and has tweeted a photo of a road in Burgeo, N.L., covered in a thin layer of snow. Other photos on social media show wet snow covering cars and a sprinkle of snow on deck furniture. Millertown Newfoundland 4:25am THIS morning. Environment Canada says the temperature was hovering around the freezing mark in some areas. But it doesn't appear the snow will be sticking around. The national weather forecaster has issued rainfall warnings for eastern and central parts of Newfoundland, where between 40 and 70 millimetres of rain could fall by Tuesday evening.